In matters of the heart, specifically heart urchins, love (Lovenia cordiformis, that is) is a prickly thing. Most sea urchins look like globular pincushions, but a view of Lovenia’s body from above reveals the shape of a sweet heart. Orb-shaped sea urchins further flaunt their heartlessness by sporting flashy colors like purple or red and boldly perch atop a rock or other substrate out in the open. In contrast, the petite (to 2 inches long) wallflower Lovenia is off-white to beige and spends most of its time partially submerged and plowing through the sandy bottom. In reality, neither shyness nor weakness has to do with this behavior. A burrowing heart urchin doesn’t eat from the same menu as a round urchin, largely because it lacks the toothiness of the latter. Instead, the hearty one combines travel with dining, plowing through the grains while ingesting the organically rich muck and filtering out food particles. The two urchin types do have spines in common, but those on a heart urchin lie flat in a backward-pointing position against its body. Don’t be fooled by this seemingly benign orientation. Those who risk rubbing Lovenia the wrong way (including humans) may discover that a heart urchin cannot be trifled with. Upon irritation, the spines bristle like cupid’s fabled arrows to penetrate the flesh of the offender — and being Lovenia means never having to say you’re sorry. 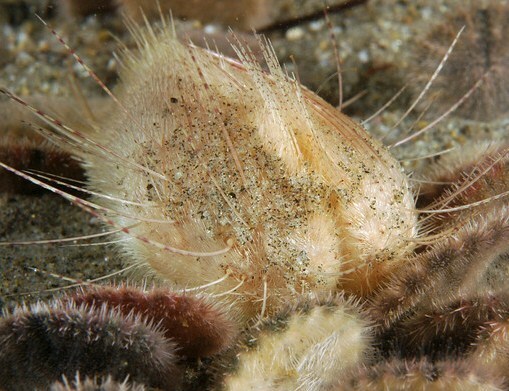 The defensive spines also act as a dense coat to keep sediment at bay, making a buffer space of water around the body so the urchin can breathe while buried. 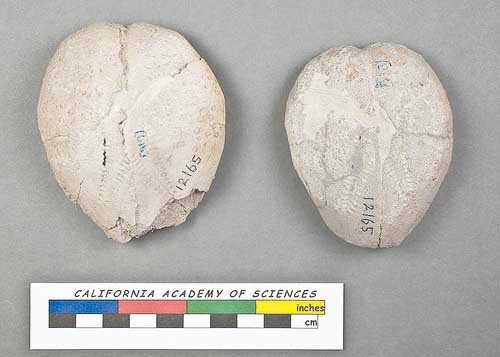 Our local Lovenia, a member of the Echinodea family that also includes sand dollars, is actually a Mexican species whose northern range extends to Southern California. It remains out of reach to tidepoolers and most snorkelers, preferring water depths beginning at about 25 feet. Fish like sheephead and sand bass that populate the sand flats and submarine canyon off La Jolla Shores prey on heart urchins. I’ve been privy to a male sheephead munching on an urchin apparently unconcerned by the spines impaling its lips. It may not be hurting him but the same cannot be said for me as I took in the scene. I wonder that urchins are also snacks for the California bat ray because broken hearts (their calcium carbonate skeletons) are frequently found in sand depressions left by the rays shoveling up sand for buried food treasures. Although heart urchins aren’t rare per se, I see them only periodically off La Jolla Shores. During those times, they aren’t solo sojourners but traveling in numbers, possibly in pursuit of romance. This requires cozying up to one another so that when the eggs of some and sperm of others are simultaneously released into the water, they connect. Talk about love being in the air — er, water. This technique has proved fruitful as demonstrated by the more than 8,000 urchin species identified in the fossil record dating back 450 million years. Today, the 800 species or so that exist range from the Arctic to the Antarctic to tropical and temperate points in between, making them ubiquitous as well as, um, hearty. For me, this means that wherever I dive around the world, odds are good that I may meet up with some sister species of Lovenia. How heartening.